A biography of former SVP National President Noel Clear, is due to be published next Saturday by Veritas Publications. 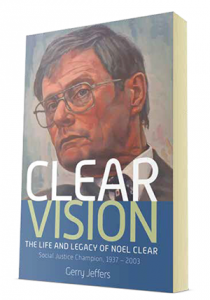 Entitled Clear Vision, The life and legacy of Noel Clear, Social Justice Champion 1937-2003, the book is written by Noel’s close friend Gerry Jeffers. Fittingly, the book is to be launched in Noel’s beloved Inchicore, at Richmond Barracks on the St Michael’s Estate. The person with the honour of launching the book is Catherine Byrne TD, Minister for Health Promotion and the National Drugs Society. Noel, who died in 2003 aged 65, was National President of the Ssociety of St Vincent de Paul from 1996 to just a year before his death, and before that he had served for six years as president of the SVP’s Dublin Region, but his work for social justice went right back to his school days. Before he had completed his Leaving Cert at Westland Row CBS, Noel had set up a youth club in Keogh Square in his native Inchicore and soon afterwards he joined his local SVP conference, which included many very energetic volunteers. Under the banner of St Vincent’s Youth Centre, they organised sports activities, club nights, literacy classes, amateur drama productions, Christmas parcels and summer holidays. Through the SVP, he met his wife Anne Braine from Drimnagh, whom he married in 1972 and the couple settled very happily in Inchicore where they brought up three sons. As well as the SVP, Noel was an active member of Conradh na Gaeilge and the Legion of Mary. Professionally, he worked at Kennedy’s Bakery and then Gaeltarra Éireann before joining the Probation and Welfare Service in 1964 where he served for 37 years. As SVP National President, he can be credited with modernising the organisation and introducing elements that are key to its work today. In particular, Noel championed the establishment of the Social Policy Division and the appointment of policy officers. As a result the Society of St Vincent de Paul is in a much better position to act as an advocate for social justice and a voice for the voiceless. When the SVP today produces a detailed analysis of the budget or of government policy, the society does so partly as a result of the work of Noel Clear.